I don’t know why no one ever told me about podcasts. That’s all changed in the past few months. Whether it’s a 10-hour car ride where my fiance and I run out of things to talk about, or my utter inability to put up with the nonsense that is morning talk radio on my morning commute, podcasts are my new jam. And honestly, I’m entirely spoiled for choice, especially as someone who’s playing mad catch-up on a wealth of wonderful personal finance podcasts. If you, like me, are new to podcasts, or you’re just looking for some great personal finance listening for your commute or your workout, make sure to fill up your phone with these three (and a half) great podcasts. Other than Serial, this was the podcast that really convinced me that podcasts were worth getting into. That’s right – it’s Serial levels of great, or at least I think so. Jessica Moorhouse is a fantastic host and she really gets to the personal in personal finance with every guest. Ok, any podcast that has Tim Gunn pulling back the curtain on the not-so-glamourous financials of working in fashion has a place in my iTunes library! (I spent some time working in fashion marketing, and the correlation between how cool a job seems and how little is pays is so. real.) Seriously though, Farnoosh is an excellent host, and she’s lined up an absolutely star-studded guest list during her time podcasting. This is one of those podcasts that has an extensive library of past episodes I’m just getting into, so while I can’t say much about anything other than the most recent episodes, I’m also maxing out my available phone space with past episodes. With guests like Tony Robbins, Danielle Laporte and so many more, plus an awesome host, I know it’ll be worth it. 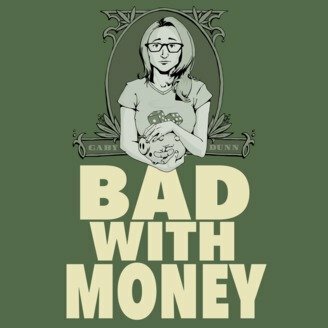 If you’re still not entirely sold on “listening to people talk about money,” Gaby Dunn’s Bad With Money podcast is the podcast you’ve been looking for. I promise. How are you not already listening to it?! That said, there is some serious learning to be had, especially if you want a behind the scenes look at the business of financial advice! And as a bonus, any personal finance bloggers can take a lot of stellar marketing advice away from it. As for me, I’m bouncing around the idea of taking the CFP prep courses, so I love hearing more about the profession from people who live it day in and day out. So, have you discovered the magic of podcasts? Was I really the last one? Also, which other personal finance podcasts are you listening to? I’d love to check them out! I listen to your top 3 listed and just downloaded some XYPN episodes. Another one of my favourites is The Money-Guy Show. It’s American based, much like some you’ve listed, but offers some great advice in every episode. I like all 3 (haven’t heard of the half) that you mentioned. I also listen to Stacking Benjamins (http://www.stackingbenjamins.com/) and You Need A Budget (can’t find a link for the podcast) and The Dave Ramsey Show (don’t judge me) because talk radio is my jam. And when he makes me mad with political stuff he does a debt free scream and I forgive him for a bit. Stacking is probably my favourite – especially Fridays when they do a round table discussions, although Mondays and Wednesdays are also awesome. They’ve got a huge library (for now) of old shows and have great guests on regularly. Highly recommend. Thank you so much Katelynne, and thank you again for the amazing catch on Twitter about my egregious image misstep! Hugely appreciated, and I’m going to check out all of your recommendations! As if YNAB has a podcast too – they pretty much kill it at marketing, all the time. I’m totally going to cave and buy their software one of these days. Do you think that’s too nerdy of a Christmas gift to ask for on my wishlist? Oh who am I kidding, my family has met me, they won’t be phased. PS. Honestly, I had no clue Dave Ramsey was so polarizing until super recently, so no judgement at all! Plus, now I’m intrigued and need to experience this debt-free scream for myself. I’ll let you know when I hear it for the first time! No problem! I felt super weird tweeting it because who knows the logo of their podcasts. But it’s because I started listening just before Matt left and then the logo on my podcast changed and I was OBSESSED with finding out who it was on the new Logo. Thomas also has another podcast (College Info Geek) that I listen to regularly or at least the non-school related ones and he’s got a lot of good habit building interviews/discussions which I find awesome and nerdy. If you’re looking for some non-money related ones too: Real Simple (I like the cooking ones and the Adulthood Made Easy ones the best the other two I could skip) and Mortified or, the Canadian version, “Grownups Read Things They Wrote as Kids”. I have like 5 others I could suggest…Since getting a dog I have really dived into the podcast world because dog walks + podcasts make winter dog walking way more enjoyable. To super-reiterate: I seriously appreciated it, and it’s not weird at all! We *all* have things we love that much, haha. We’re all on the internet talking about budgets, so this is clearly a no-judgement zone! Adulthood Made Easy sounds like the absolute dream podcast, lol, so I am all over that. Yay, podcasts are awesome!!! I do really enjoy So Money (Blonde on a Budget was on it recently, as was Mrs. Frugalwoods!) I’ll have to check out these others. I would also definitely recommend Planet Money (it’s just the NPR segment distributed as a podcast), as well as StartUp, which I am currently OBSESSED with — it’s peripherally about money but mostly about entrepreneurship, and fascinating even to people such as myself who do not really qualify as entrepreneurs. Given my extremely delayed love of Serial, anything even vaguely NPR sounds phenomenal, so I’m definitely adding Planet Money to my list! And I’ve actually spent the bulk of my career in and around startups, so the other one sounds right up my alley as well. Thanks for the awesome recommendations! I’m clearly going to have to do a follow up post with all my newly-discovered favourite podcasts, haha. Ooh, also Reply-All (random cool stories involving the internet)! And Mystery Show (hard to explain but awesome)! Both NPR-ish. Also Radiolab (science for total laypeople)! And, if you want to try a hilarious podcast in which I guarantee you will learn absolutely nothing: The Worst Idea of All Time. Sorry, I just get so excited about podcasts! Don’t ever apologize for liking something a lot! That is like, my mantra in life, since I’m always the person who gets wayyyy overexcited about things (like getting really into money and deciding to save half her income without even really thinking it through… you know, as an example.) Things are much more fun when you go all in like that, and I love having a long list of highly recommended podcasts to catch up on! I can’t go back to morning talk show radio Sarah. It’s so bad. Sometimes I forget to plug in my iPhone and I end up listening to it, and it’s SO bad. And the jingles. I can’t with the jingles. So having podcasts lined up will save me from that fate! You’re pretty much an internet lifesaver. Fact. Great suggestiond-I may check these out! Dave Ramsey show – I love to guess what he’ll say- I get surprised sometimes! Sawbones-a medical show with the wife dic and her goffy husband. Hysterical and fun for when my husband has been Dave Ramsey’s out. Thanks Suze, and thanks for taking the time to add some recommendations! That’s the second Dave Ramsey recommendation, so I will 100% add it to my list and check it out. I whole-heartedly approve of your podcast love. Serial was one of the first shows I listened to as well, and I never looked back. I LOVE So Money. Farnoosh is awesome and I love her hosting style. For money podcasts, I highly recommend Mad Fientist (http://www.madfientist.com/podcast/) Although he doesn’t produce them regularly, there is a pretty big back log of amazing interviews. His podcast is specifically about financial independence/early retirement and his guests are always inspiring and informative. For non-financial podcasts, I recommend anything by Gimlet Media. Start-Up (https://gimletmedia.com/show/startup/) is AMAZING and The Mystery Show (https://gimletmedia.com/show/mystery-show/) makes me laugh like no other. Thanks for the post and podcast recs. I can’t wait to try out Mo’ Money! Amazing, thank you so much for the recommendations Taylor! You’re the second person to recommend Start-Up, so it’s pretty high up on my list – especially as someone who currently works in a startup! I love the Mad Fientist blog posts I’ve seen around the web, so I’ll check that one out as well. I’m no stranger to playing catch-up on old episodes, clearly, haha. I love the idea of podcasts. I love the potential of so many different options. Unfortunately (but is it really?) my commute has gone from 1 hour to oh..5 minutes. Which is not optimal for podcasts, reading, or music. 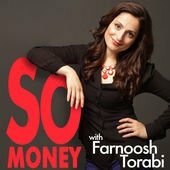 Farnoosh is my absolute fav! I love that her podcasts usually run between 20 – 30 minutes so I can squeeze hers in during my morning commute or run. She answered one of my questions on her Ask Farnoosh episodes awhile back :). I also love LMM – they talk about finance in a very informal and entertaining way. Haven’t heard of Mo Money – I’ll definitely give it a shot! It’s a little jarring at first, but I recommend listening to podcasts and audiobooks at 1.5x speed. It helps cut into the time w/o everyone sounding like Alvin and the Chipmunks. Oh no way, that’s awesome! Vic, you’re basically podcast famous. That’s the coolest. And I’m no stranger to the speeding up trick, haha – I took a few psychology classes delivered via video while I was in university, and the professor spoke more slowly than I thought was even possible, so I sped him right up to 3x. I still aced the class, so clearly it worked! I also thought of you guys since I’ll be embarking on some business travel of my own in January (wooo trade shows! By woo I mean oh god the lack of sleep is already getting to me) and I figure the plane rides, especially after the show when everyone is just fried, will be a great time to catch up on podcasts. After spending a week together not sleeping, not even the executives want to talk to each other about work, haha. 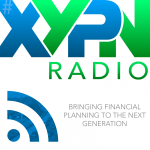 You listed some great ones but one I recently discovered is Radical Personal Finance, Joshua is a former financial planner and does a good job explaining a lot of basics. It’s not entertaining in the funny sense, like LMM or Stacking Benjamins, but it’s chock full of information. That’s awesome! I’m all about the informative podcasts – and as someone who tells the worst jokes IN HISTORY, funny isn’t something that’s make or break for me, haha. It would be too hypocritical of me to demand that all of my information also be entertaining. Thanks for the recommendation, Jim!